Flashing defends against water to keep moisture from getting inside the building. Obviously, water penetrating into unprotected parts of a house can cause molding, decay, and extremely expensive repair. So isn’t it obvious to use the best material for flashing? Copper flashing offers high aesthetics, lasting value, little maintenance and an extensive life. It is especially advantageous to have in highly humid and wet regions. Unlike most other flashing materials, copper can be reused on a new roof. Copper is almost the same cost of galvanized steel and is more expensive than corrosive metals but lasts much longer. There is no doubt that copper is the optimal metal for flashing when it comes to class, endurance, and longevity. 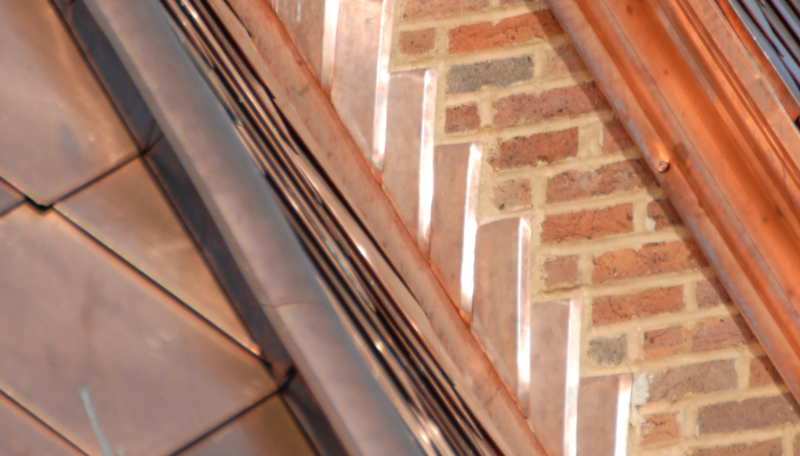 Copperworks has decades of experience in copper flashing, especially on slate roofs. While flashing is important, it is also something that can be detrimental if installed improperly. To see more about our most recent award in copper roofing, click here.